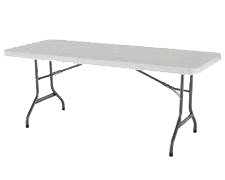 Tables seat up to 8 white folding plastic chairs. Setup is not included. Weekend rentals are available for pickup on Friday and return on the following Monday. Table tops are made of plastic. We recommend using a table cover.